Organizations spend big bucks maintaining equipment. How many times have you heard that a critical piece of your equipment is down, and the spare part needed isn’t in stock or can’t be found in the warehouse? A robust Inventory Spares Management program will ensure the ability to find the right part exactly when it is needed. When a critical piece of equipment goes down, the effects can be detrimental to the plant/production facility/distribution center, etc. Not having (or not being able to find) the spare(s) needed to repair the equipment in a timely manner can create a “butterfly effect” that can be felt all the way down to the consumer level. Organizations that don’t have the right parts at the right time can suffer extreme consequences (production loss, safety issues, wasted money, and lost time). Many organizations have some sort of Warehouse Management System (WMS) or Computerized Maintenance Management System (CMMS) to aid in keeping track of spares; however, a system is only as good as the data it contains. Simple steps can be taken to ensure integrity of the data in your system and having the right parts at the right time. A good way to get started is by setting up minimum/maximum levels and reorder points/quantities for spares inventory. This will take time, but determining part criticality is a very important step. Criticality will have a major impact on your Economic Order Quantity (EOQ). There are usually queries or reports set up in the WMS or CMMS to run on a regular basis (weekly, daily, etc., depending on the needs of your organization) to show when to reorder parts and how many to order. You can also write your own queries and reports fairly easily if they don’t already exist in the system. 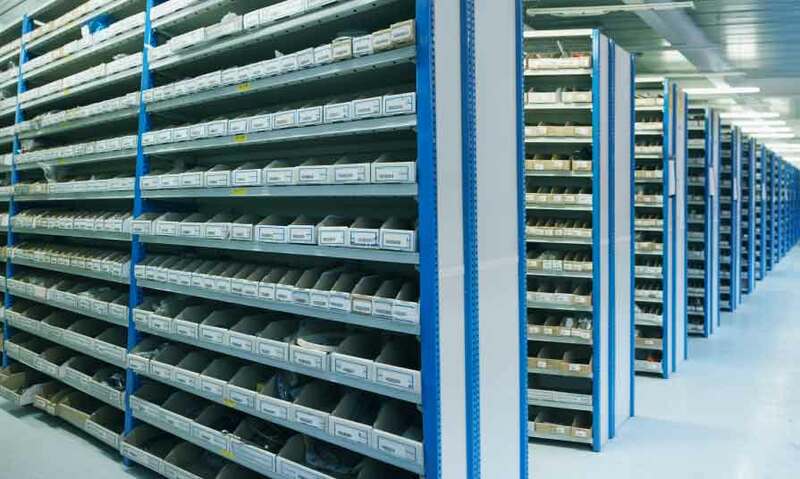 Needs of spares are likely to fluctuate based on usage, age of equipment, and obsolescence, so min/max levels will need to be evaluated and adjusted periodically. Work orders will need to be entered into the system every single time work is performed. Every spare used will have to be accounted for, so techs don’t go to the rack looking for a part that isn’t there when the system says it is. Part cycle counting is also an excellent way to help keep a handle on your spares inventory. Determine which parts are most frequently used, and count them often (for example, count your 30 most used part numbers on a quarterly basis). Count every single part number at least once a year. Another thing you can do is to count the number of parts remaining in the storage location when retrieving a part. Make certain that differences are reconciled in the system. Any high-value parts whose quantity doesn’t match the quantity in the system should be counted again. If the count and system quantity still don’t match, evaluate whether to count a third time. Make sure bins and storage areas very close to the spares storage are also checked. It’s pretty easy to accidentally place parts in the wrong location, especially if they look similar to others sitting nearby. Make certain that part locations are thoroughly documented and updated in the system. Most WMS or CMMS have bar-coding capability, which makes tracking down the location of a part very intuitive, during receipt and use.